Most people will probably associate hearts with Valentine’s Day — not Thanksgiving — but stick with us on this one. We are honored to have contributor Katie from Live Craft Eat sharing a new Thanksgiving activity for kids and families. 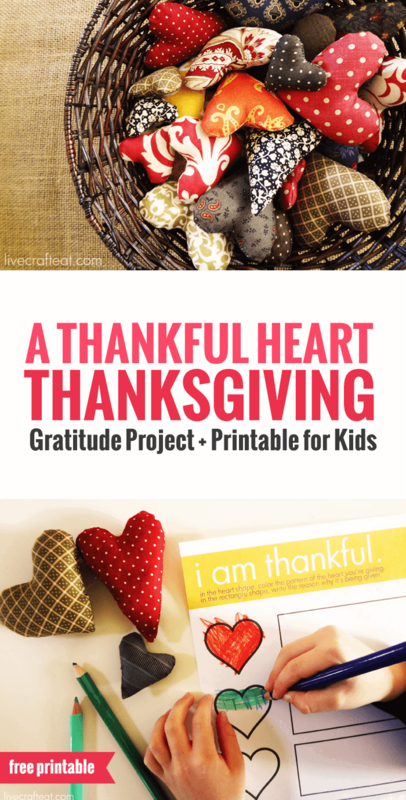 The “A Thankful Heart” project is sure to be an ongoing family tradition. My husband and I have lived far away from our families for the past couple of years. While it is difficult spending holidays and other special occasions away from them, it does give us the opportunity to introduce and develop our own family traditions with our children. I believe last year’s Thanksgiving involved a lot of turkey and cranberry sauce in addition to all-day football. I don’t intend that to change too much, but I do look forward to introducing a few new things in addition to the things my family already loves. 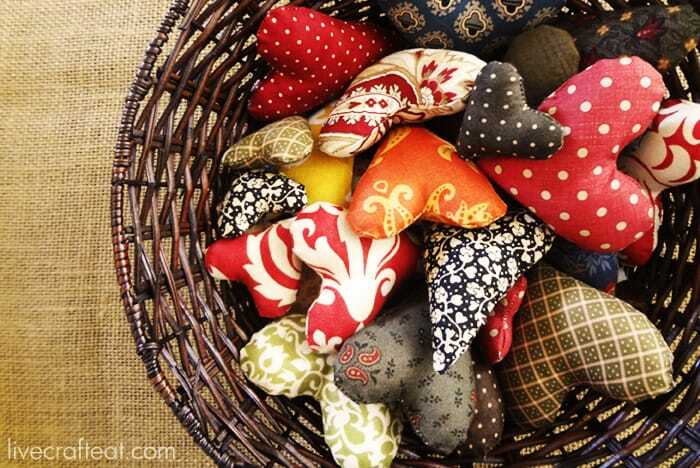 One of those things we’re starting this year involves making a whole lot of hearts using scraps of fabric. If you have lots of fabric scraps, too, then this activity will cost you almost nothing to make! If not, you could definitely use paper or other materials in lieu of fabric to make this activity both affordable and successful! My kids loved helping me stuff these hearts, so I think we’re going to stick with them. Visit Live Craft Eat to get full instructions and templates on making these little cuties. Most people will probably associate hearts with Valentine’s Day – not Thanksgiving – but stick with me on this. Valentine’s Day is about love – expressing the love that we have for other people. We draw cards for our parents telling them how much we love them. We give candy and flowers to our spouses to express the love we have for them. The way I see it, Thanksgiving is also about love – except it’s about recognizing and acknowledging the love that other people show towards us whether it be through service, acts of kindness, or tasks that are performed on our behalf and for our benefit. Thanksgiving is all about taking note of these things and then taking the time to thank that person for what they do. I read once that you can learn to love a person by consistently doing nice things for them. I also think, especially in a family setting, that people do nice things for others simply because they love them. So here’s how we’re attempting to help our children recognize those things that the people who love them do for them, however mundane it may seem. To take it just a step further, I’ve made a printable “I Am Thankful” chart so they can keep track of the nice things people do. My hope is that Thanksgiving will not just be a day of feasting and football, but a day to consider and be grateful for all the things we do for each other – to appreciate and love each other more. And I hope it will be a standing tradition in our family for years to come. What traditions do you have in your family to celebrate Thanksgiving? Katie Heap is the author of Live Craft Eat–a place where she writes about her 3 loves: raising her family, her crafting endeavors, and learning to cook. You can subscribe to her blog or follow Live Craft Eat on Pinterest and Facebook. Visit her Thanksgiving Pinterest board to find more Thanksgiving ideas. Such a great way for kids (and adults) to focus on others! how special someone would feel to receive a charming heart like this. i wonder about putting a drop of nice smelling essential oil on it as well. Such a wonderful idea ! In lieu of paper for those that do not have fabric scraps people could repurpose the not quite good enough for donation clothing or other linens before it hits the rag bag. Thank you for reminding me what Thanksgiving is really for – gratitude! What a beautiful idea! I am always searching for ways to include my kids in doing good deeds for others and this is perfect. In fact, I just shared it on my blog at http://www.onepartsunshine.com/blog/3407. I love this idea! It might be a little late for me to whip up some cute little stuffed hearts but it’s something that’s going to make my plans for next year. Thanks! 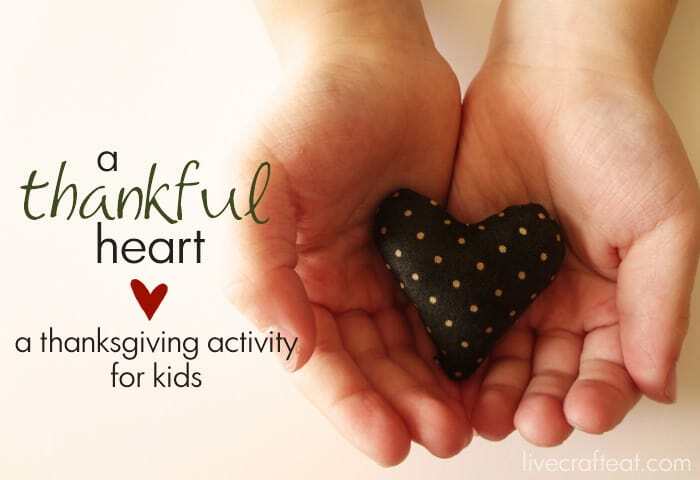 Kate, I just read your post about Having a thankful heart and it reminded me of something we did as a family when our children were young one Christmas. During Advent at our Sunday night dinner we pulled a name out of a basket. This was our special someone for the week. We had to keep their name a secret. Then throughout the week we would do little things for that person … trying not to be seen! The next Sunday we would put the names in again and pull out a new tag … sometimes they got the same name but not always. It was so much fun … and the best part is that our children are now all grown up but they still remember with fond memories when we did this! I am sad to say my little ones are now all grown up … but doing little things when we were all together was so much fun. This morning I got a text from our son telling us that he helped his middle sister find the clinic where she will be doing her next placement on their walk with the dog so that she wouldn’t get lost in his neighbourhood on her first day! Enjoy your special times with your children … they grow up too fast!